Do You Know GOD ???? So, how do we tune these yagi antennas ??? I love using the Gamma Match to tune my yagis, because it allows me to build an easy ,clamp--onto--the--boom element ( no insulating plate etc ) --- Yes, a Gamma Match does have losses , but it is mostly noticeable at vhf and uhf ....At HF , Gammas work good and makes tuning so easy . This is the Gamma Match design that I have used for years, and is also similar to what Avaniti uses ------- I have seen designs using a 5 1/2 Gamma Tube ( 2nd Drawing below ). Antennas like the 2 element Delta Loop or V-Quad , uses the same same Gamma Match EXCEPT that the Gamma Rod = 36 inches instead of 24 inches. This 2nd design is similar to the one above ,but has a 5 1/2 inch Gamma Tube which also works as well. The Gamma Match is nothing more than a capacitor like ...... The 24 inch long Gamma Rod / Sliding Rod is insulated from the Gamma Tube by a plastic insulator. This can be just about any material. The Tube is 10 inches long made from 3/4 inch tubing is attached as shown. The Gamma Rod is slid in and out of the Tube to match the driven element to the feed-line. A pair of straps are hung to the driven element to hold the matching unit in place. A very critical adjustment is to maintain the Gamma parallel to the element at a distance of 4 inches Center to Center of the elements .... The inside strap is made from any insulating material and the outside strap is made of aluminum bar stock. 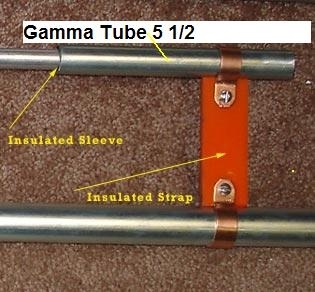 The Gamma clamps can be made of plumbers copper strap. V Quad / Delta Loop arrays Gamma Match uses a 36 inch sliding rod instead of a 24 inch sliding rod . Look on my 3 element Yagi page, and you will see a closeup of the Gamma Match I built .......... I used PVC Tees to build the insulating strap .....I used 3/8 aluminium tubing for the 24 " sliding rod, and the Gamma Tube is 3/4 " aluminium tubing ..... The insulating material between the sliding rod and gamma tube is a 10" piece of rubber hose . One thing to note when adjusting for low SWR on a Yagi antenna , if the swr is not low enough after a million trys at gamma match , at the frequency the antenna is designed for , try lengthening or shortening the driven element by one inch on either side ..... I had a guy that emailed me about problems getting swr down to 1.0 .. His lowest swr was 1.5 , he did what I suggested and shorten the element by 1 inch per side of driven element , and swr came down to 1.2 , he says he will try shortening a bot more for a 1.0 reading . Rule of thumb with antennas --> the higher in frequency you go , the shorter an antenna will get ... The lower you go in frequency , the longer an antenna becomes .